A total of three hundred sixty (360) Instant Win prizes will be awarded. A total of ninety (90) Monthly Sweepstakes prizes will be awarded. Five (5) grand prizes will be awarded. Each grand prize consists of a trip for two to Jamaica and includes round-trip coach airfare for two from the gateway airport nearest winner’s residence, hotel accommodations for two (2) people—one room, double occupancy for three (3) nights, two tickets to Reggae SumFest, round-trip transportation between the airport in Jamaica and the hotel, and round-trip transportation between the hotel and the Reggae Sumfest. ARV of each grand prize: $4,000. ARV of all grand prizes: $20,000. ARV of all prizes: $65,750. 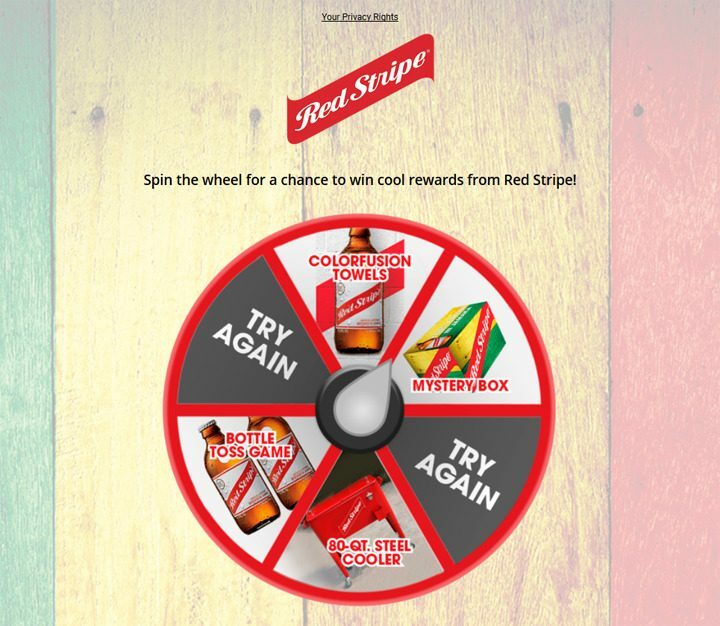 The Red Stripe Rewards II Promotion is open only to legal residents of the fifty (50) United States and the District of Columbia who are 21 years of age and older, except New Jersey and Texas. There are two (2) ways to enter the Promotion: (a) via SMS, or (b) on the Internet. SMS Entry: Submit an SMS entry from your mobile device by texting one of the following key words to 88500. The key words are: “GOODVIBES,” “REDSTRIPE,” AND “SUMFEST.” Upon receiving a bounce-back message with a URL. Click on the link and follow the prompts to enter. Internet Entry: To submit an Internet entry for free, visit linkto.us/rsr1 and follow the on-screen prompts to enter. Limit one (1) entry per person per day regardless of method of entry.